Let me design and craft for you a chair, table, or bed that fits you and your space perfectly. We set the brief together and I apply my skills and interpret your needs in a visual way. I truly enjoy working with my clients and I set out to make the process easy, fun, exciting, and rewarding. I will work with you on producing a concept (design sketches) based on our brief and then we will discuss construction and wood choices. 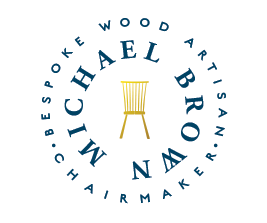 Commission me for one-off pieces or an entire suite of fine English furniture in a modern clean, and traditional style. It all starts with your idea, we talk, we e-mail, I sketch. I collect your deposit and I pick out your wood then we get started. Whenever possible I will photograph your chair or furniture through the stages of production and give you an album of handcrafting your family heirloom. Many people ask, “what exactly is bespoke furniture?” I respond with a simple answer. Simply put, bespoke furniture is furniture that has been made to measure, to fit you or your space perfectly. Whatever use you want to use it for and how you want it to look is custom tailored, “Made to measure” just for you and your family.